Church House is very easy to find. It stands right opposite St Mary’s Church in Kington, which is on the hill at the western edge of town. First find Herefordshire. Actually, first find England! This is part of that big island stuck off the top left corner of Europe. Herefordshire is about 150 miles north-west of London, and about 60 miles west of Birmingham. The border with Powys (Wales) is just 2 miles further west. Kington is 21 miles north-west of Hereford (along the A438 and then the A4111) and 15 miles west of Leominster (along the A44). When you reach Kington, follow signs for the town centre (avoiding the bypass). Go straight through the centre of town, following the dotted white lines. You should find yourself going up a long steady hill, with the Swan Hotel on your right. When the road levels off, the churchyard and lychgate are on your right. 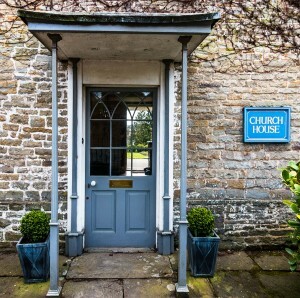 The iron railings on your left indicate Church House, which is clearly named. Ring the front door bell and we will show you where to park your car if you have one. Simple!